allmetalworking CORP. provides its services solely to enable our users with legitimate requests for products and service information to contact the companies in the allmetalworking News Center and other partners and suppliers. We are not involved in the actual transaction between buyers and sellers. As a result, we have no control over the quality, safety or legality of the items transacted; the accuracy of the information or specifications provided; the ability of users or buyer to buy items, the ability of users or suppliers to deliver items promised or the ability of buyers to pay for items. We cannot ensure that a user, buyer or seller will actually complete a transaction or that the transaction will be completed in a satisfactory manner. It is user’s sole responsibility to qualify the supplier or buyer that you choose to do business with. You understand that all information, data, text, software, music, sound, photographs, graphics, video, messages or other materials (“Content”), whether publicly posted or privately transmitted, are the sole responsibility of the person from which such Content originated. This means that you, and not allmetalworking Corp. are entirely responsible for all Content that you upload, post, list, email, transmit or otherwise make available via the allmetalworking News Center website. You understand that by using the allmetalworking News Center website, you may be exposed to Content that is offensive, indecent or objectionable. You are solely responsible for any information entered or posted by you. allmetalworking News Center does not guarantee the accuracy, integrity or quality of Content. Furthermore, you may not list any information on the allmetalworking News Center website (or consummate any transaction that was initiated using our service) that, could cause us to violate any applicable law, statute, ordinance or regulation, or that violates any patent, trademark, other intellectual property rights, trade secrets or any other rights of another party. You agree that you will not use our services, website or applications for chain letters, junk mail, “spamming” or commercial solicitations or to send any message or material that is libelous, defamatory, obscene, pornographic, threatening, invasive of privacy or publicity rights, abusive or illegal; contains viruses or other features that might contaminate or destroy this website; or otherwise gives rise to liability or violates any other applicable law. intentionally or unintentionally violate any applicable local, state, national or international law and any regulations have the force of law. You agree that allmetalworking News Center may, in its sole discretion, and at any time, discontinue, suspend or modify this website, including portions thereof, temporarily or permanently, without notice to you, and you agree that allmetalworking News Center shall not be liable thereof. allmetalworking News Center does not guarantee the accuracy, integrity or quality of Internet Service. We may ask for Registration Information about you when you sign up for an allmetalworking News Center service, and when you register for the use of this service. For example, we may ask for contact and other information. We use Registration Information to improve our marketing and promotional efforts, to analyze site usage and to improve our site and service offers. We may use Registration Information to deliver information to you and to contact you regarding administrative notices. allmetalworking News Center provides some of its services through contractual arrangements with service providers, partners and other third parties. allmetalworking News Center and its service partners use your Registration Information to operate their sites and to deliver their services. You are member and get your account and password of allmetalworking News Center while you complete registration information form. You take fully resposibility for all activities which act as your account. You should never disclose your password to any third parties. If you lose control of your password, you may lose substantial control over your Registration Information and may be subject to legally binding actions taken on you behalf. Therefore, if your password has been compromised for any reason, you should immediately change your password. All information in allmetalworking News Center, including data, text, software, music, sound, photographs, graphics, video, messages or other materials (“Content”), are protected by all copyright, other intellectual property rights and other proprietary rights. Users may use allmetalworking News Center Content solely and exclusively for personal or internal purposes. The User may download and/or reproduce limited portions of the allmetalworking News Center Content on an occasional ad hoc basis and distribute such allmetalworking News Center Content internally, solely and exclusively for personal or internal purposes. Except as expressly permitted in last paragraph, Users to this website may not copy, reproduce, modify, alter, reverse engineer, disassemble, sell , transfer, rent, license, publish, distribute, disseminate in any form or otherwise allow access to all or any allmetalworking News Center Content or third party Content. We reserve the right to modify these Terms and Conditions from time to time without notice. Please review these Terms of Conditions from time to time so that you will be apprised of any changes. 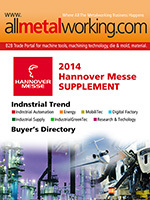 www.allmetalworking.com is a B2B Trade Portal | B2B Web Portal |B2B Marketplace for machine tools, machining services and material.